As the wearables market evolves, total shipment volumes will maintain their growth momentum. Vendors will ship a total of 125.5 million wearable devices worldwide in 2017, that's a 20.4 percent increase from the 104.3 million units shipped in 2016. According to the latest market study by International Data Corporation (IDC), the wearables market will nearly double before reaching a total of 240.1 million units shipped in 2021, resulting in a five-year CAGR of 18.2 percent. "The wearables market is entering a new phase," said Ramon T. Llamas, research manager at IDC. "Since the market’s inception, it’s been a matter of getting product out there to generate awareness and interest. Now it’s about getting the experience right – from the way the hardware looks and feels to how software collects, analyzes, and presents insightful data." According to the IDC assessment, this means that users will be treated to second- and third-generation devices that make today’s devices seem inferior. Expect to see more digital assistants, cellular connectivity, and connections to larger systems -- both at home and at work. At the same time, user should expect to see a proliferation in the diversity of wearable devices brought to market, and a decline in prices that will make these products more affordable to a larger group of potential customers. That said, IDC analysts believe that stakeholders beyond the end users will benefit from these new advanced devices. Opportunities also exist for developers and channel partners to provide the software apps, services and distribution that will support the growing abundance of wearables. From a deployment perspective, the commercial segment also stands to benefit as wearables enable productivity, lower costs, and increase ROI in the long term. 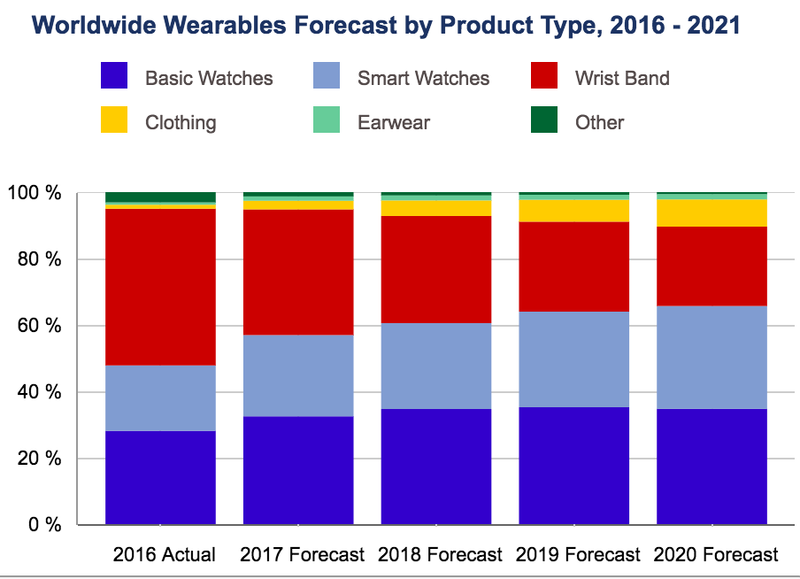 Moreover, IDC anticipates that watches will account for the majority of all wearable devices shipped during the forecast period. However, a closer look shows that basic watches will continue out-shipping smart watches, as numerous traditional watch makers shift more resources to building hybrid digital watches, creating a greater total addressable market each year. Smart watches, however, will see a boost in volumes in 2019, as cellular connectivity becomes more prevalent in the market.